Brief Recap of My Brief Seoul Trip! Sorry for the lack of posts in the last week, but I was away at a conference in Seoul, South Korea! After my last post about some of the Korean dishes I tried in preparation for my trip, a few people expressed interest in hearing what I ended up eating in Seoul. Unfortunately, I didn't end up eating much Korean food, or any food at all for that matter, but I thought I'd still share my experience while I work on making some new recipes to share later this week! We (my sister and I) arrived in Seoul late Saturday night, then attended the conference from Sunday to Friday, and left Saturday morning. Every day, the shuttle to the conference left at 6:45am (so I would wake up by 5:30), then the last meeting ended at 7:30pm, so we would get back to the hotel around 8pm. On those nights, we could either choose to walk 20 minutes to find a restaurant, sit down to eat, and then get home late and miss out on sleep, or just eat some snacks and crash, and we always chose the latter because we were so tired! The last couple of nights, the conference didn't end until 10 or 10:30pm, so we would get a 15 minute break around 6 to run and find food, and on those days all I had time to grab was yogurt, bananas, granola bars, and coffee! The good news is the conference was very successful, and I still did get to try some great food at lunchtime. I also don't mean to complain, as I still wasn't working nearly as hard as most of the other people there! Here are some of the few pictures I took on the trip - excuse the bad quality, most were just taken quickly with my phone! On the first night that we arrived, we were very tired after many hours of travelling, but still wanted to eat some dinner so we wandered around the neighbourhood (Gangnam) in search of food. 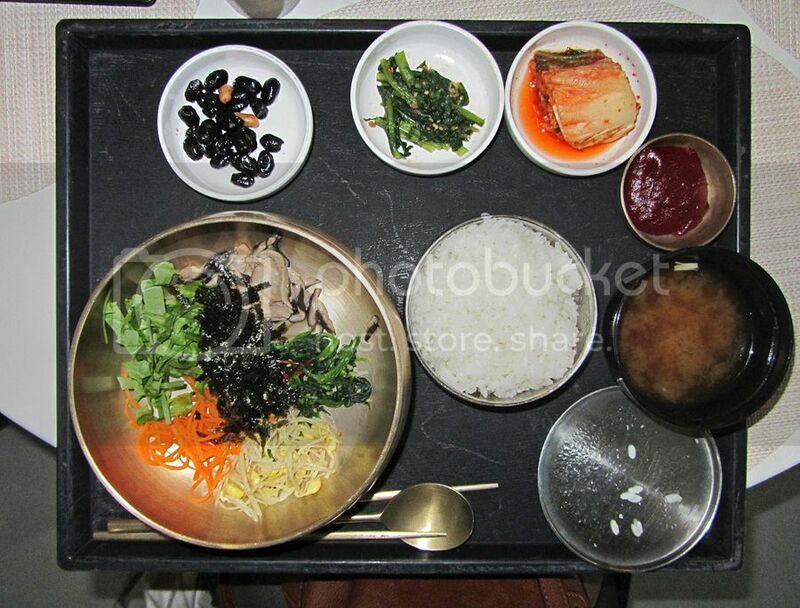 All we wanted was something to take back to the hotel, but the only restaurants we found were sit-down, and all only had Korean menus, which is a problem for a vegetarian (my sister) who can't be sure what she's ordering! We ended up just grabbing bagels from a coffee shop, but it was actually the best bagel I've ever had! So soft and filled with cream cheese and fig jam - yum! At the conference, they had boxed lunches (both meat and vegetarian) available. 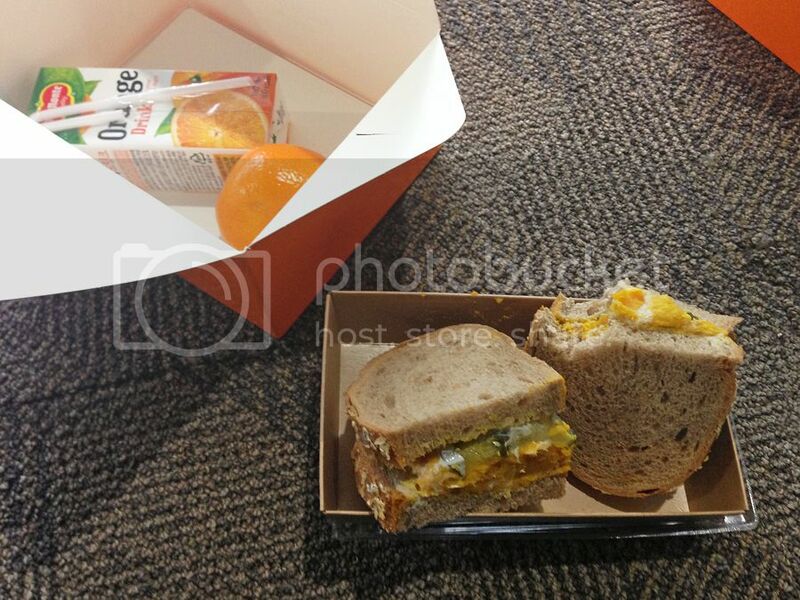 On the first day, I tried the vegetarian option, which was a pumpkin sandwich. I was pretty disappointed when I opened it up to find a teeny tiny sandwich that had pumpkin, pickles, raisins, and mayonnaise on it (very strange! ), a little orange, and that's it! Definitely not enough food to sustain me until 8pm! So on the following days we tried the restaurant lunch option, which had a couple different set meals available. The vegetarian option was either a vegetable sandwich (which was pretty much just lettuce on bread) or bibimbap, so my sister and I tried the bibimbap a few days, and it was delicious! The meal came with rice and a ton of different side dishes, some of which I'm not even sure what they were, and gochujang, a spicy red pepper paste. From what I was told, you just mix everything together in the big bowl and eat! 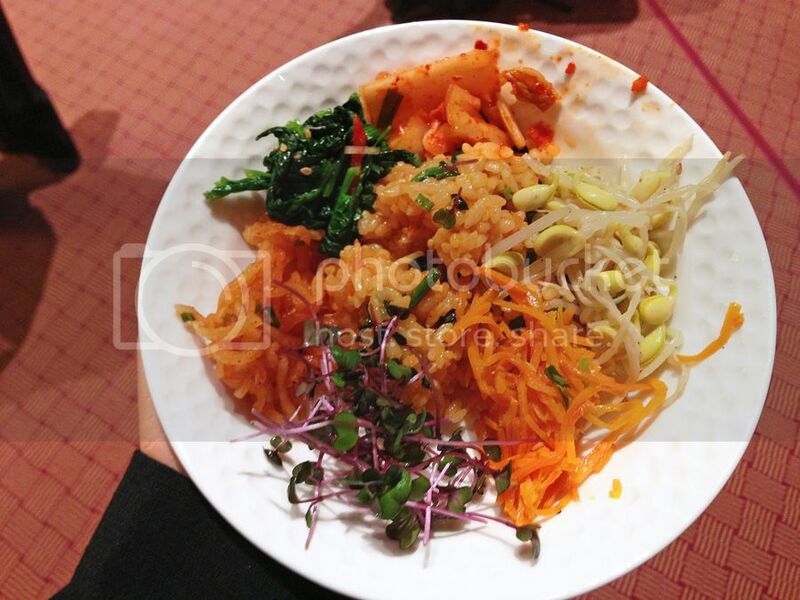 It was much more filling than the sandwiches and I liked that I got to try some authentic Korean food! If anyone knows what those little black things are in the top left corner, I'd love to know, as they were very tasty! On one of the conference days, our session went so late in the morning that lunch was already sold out before we could get it, so we went down to the underground mall below our conference center (COEX Mall) to find something to eat. We ended up choosing a Japanese restaurant because it had big servings, lots of vegetarian options, and good prices! 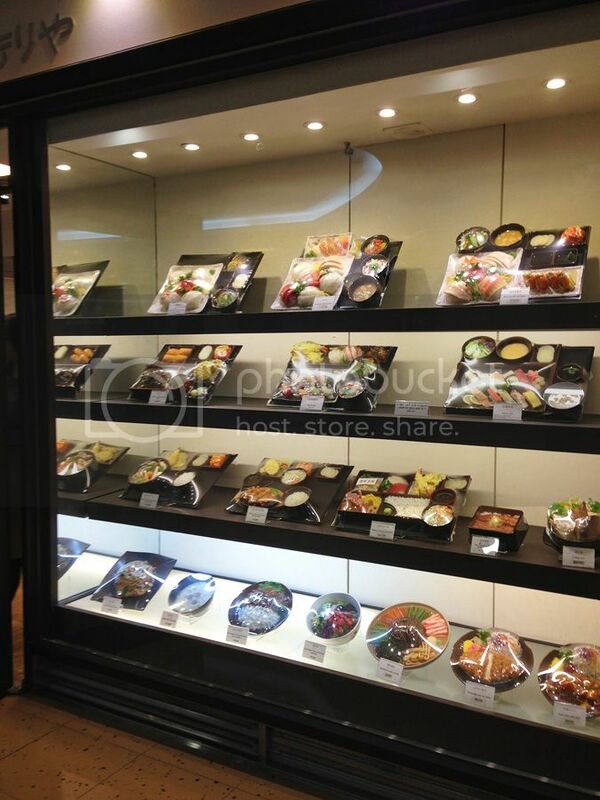 I loved how most restaurants in Seoul had displays in their front window so you could see the food options before choosing to eat there - so helpful! 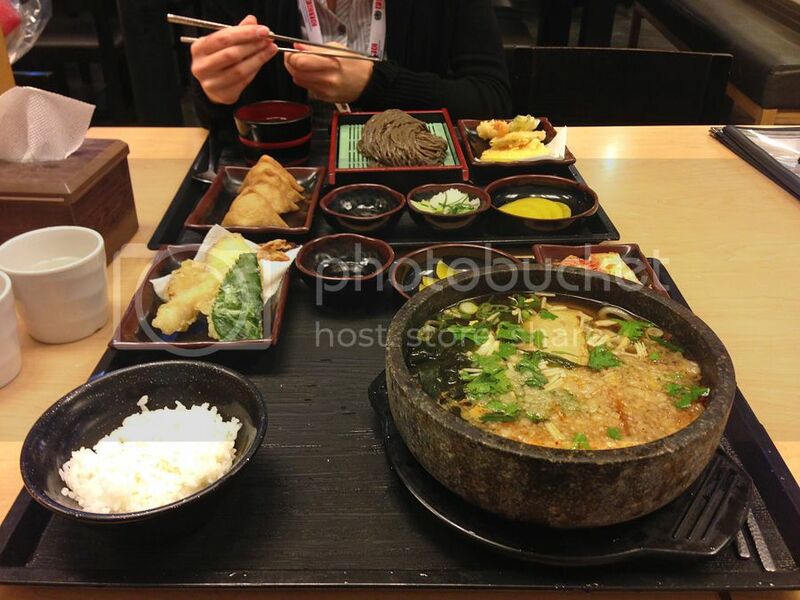 My sister ordered a buckwheat (soba) noodle meal, which you can see in the back of the picture below. I chose a kimchi udon bowl, so that I was still incorporating some Korean flavours into my lunch! The udon bowl was HUGE and I couldn't finish it all, but it was very tasty! It also came with tons of side dishes, including tempura. I think this was the first time I'd ever seen a fried (basil?) 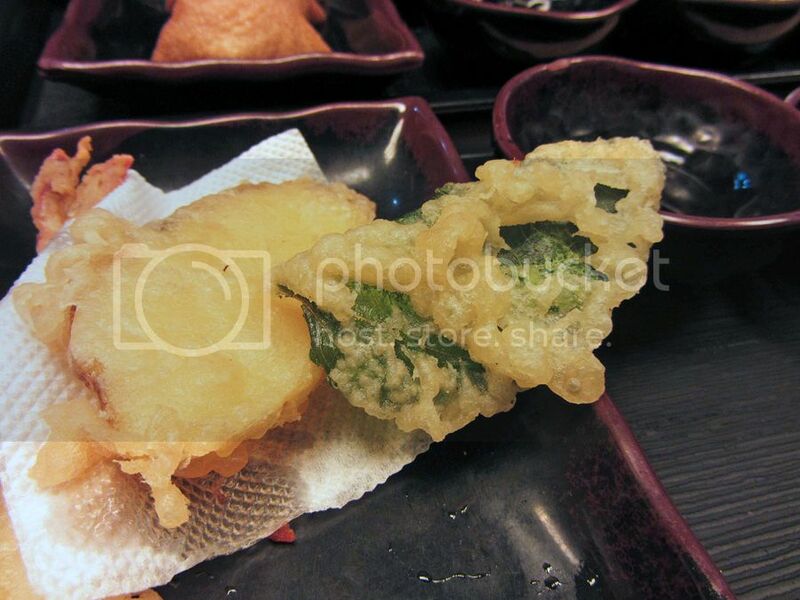 leaf as part of tempura! The rest of my meals were usually just grabbed from a 7-11 or supermarket. I always love looking at groceries in other countries though, as you can usually spot some interesting finds! 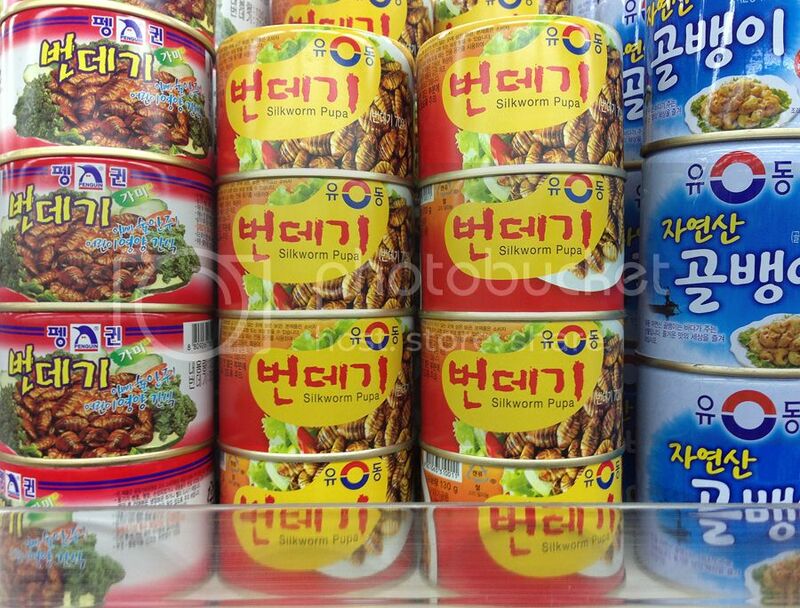 One of the more unusual items I saw in a few stores was silkworm pupa. I have no idea what you do with it, and did not buy one to find out! 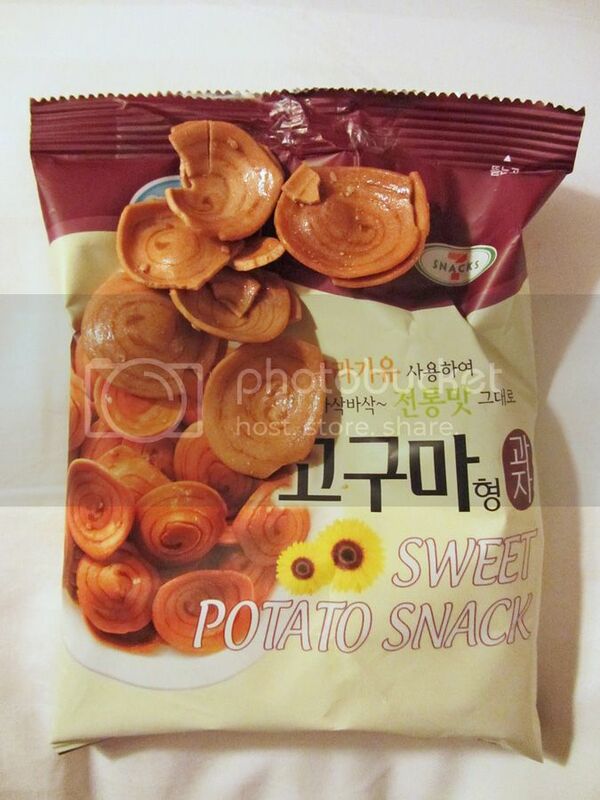 My favourite snack I tried was these sweet potato chips. They were like a cross between candy and chips, and they were so good - I wish I bought more! Coffee and tea seem to be very popular in Seoul. Almost every second store was a coffee shop (I had enough flavoured lattes and coffees there to last me a while! ), and every store had so many types of instant coffee and tea drinks. 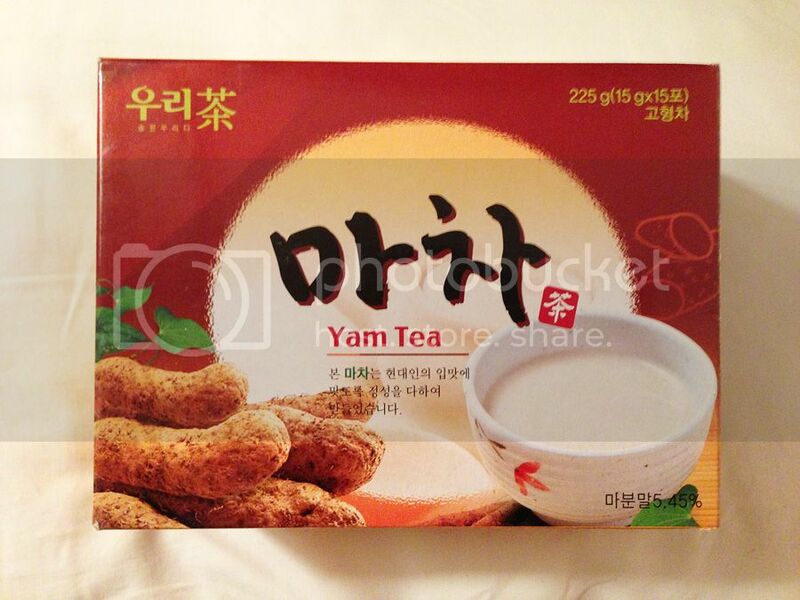 I bought this yam tea to bring back with me because it was so unusual. Unfortunately when I got home I realized it was not traditional tea as I imagined, but a white powder that you add to hot water, and I wasn't a fan! I'm more looking forward to trying the other souvenir I brought back - soju and rice wine! 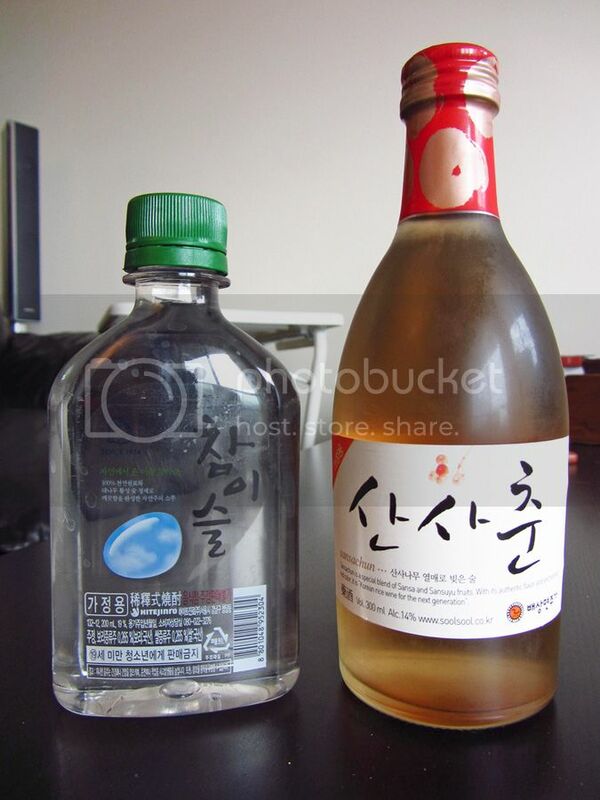 Soju is a clear, slightly sweet distilled liquor that's native to Korea. I bought that small (around 300mL) bottle on the left for just over a dollar, so it's really cheap too! There were also a lot of rice wines and fruit wines for sale; we bought some plum wine and black raspberry wine as gifts for others, and I bought sansachun rice wine for myself. I'm looking forward to trying both! On the way back home, my sister and I were craving "Western" comfort food, and treated ourselves to a large rocket pizza at the airport. It was just what we needed! A tip for travelers that most people probably know but I didn't until recently - 'rocket' is the same thing as arugula. When I went to Australia a couple years ago, I saw 'rocket' everywhere on menus but avoided it because I had no idea what it was. 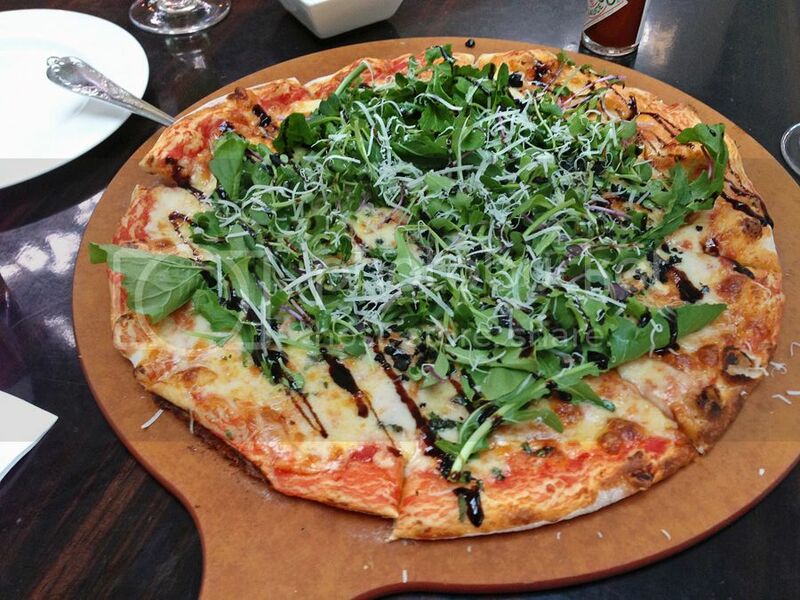 When I found out it was just arugula I was kicking myself, because I love arugula! It was probably the most disgusting looking thing I've ever eaten, but it was surprisingly delicious! I know there was mashed sweet potato and vegetables in there, but I have no idea what the rest of it was made of. I wish I knew because I almost want to try recreating it at home! Another tip for vegetarians or veggie-friendly travelers - request a vegetarian meal for the plane when you book your ticket. 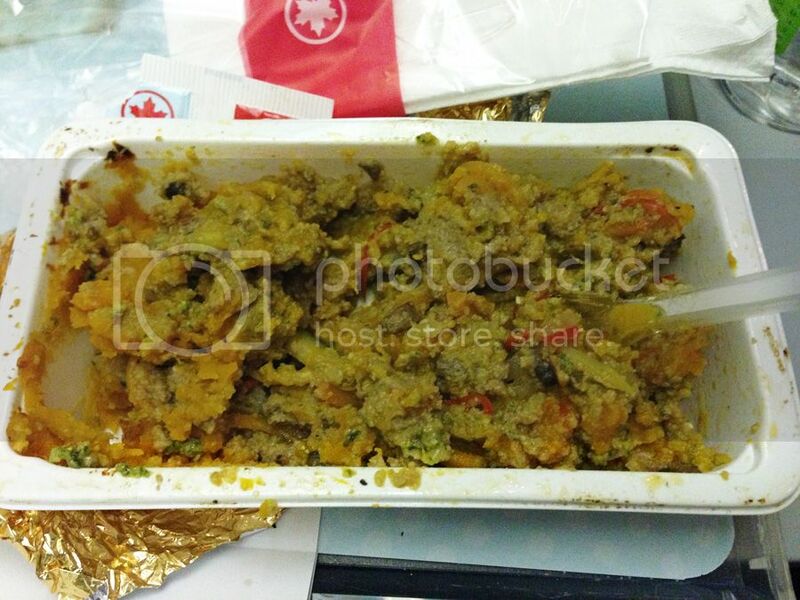 My sister and I do this for every flight we take - the meat on planes creeps me out and the vegetarian meals are usually pretty good, plus you always get delivered your special meal before everyone else! That's it from my trip - sorry it's a bit disappointing! 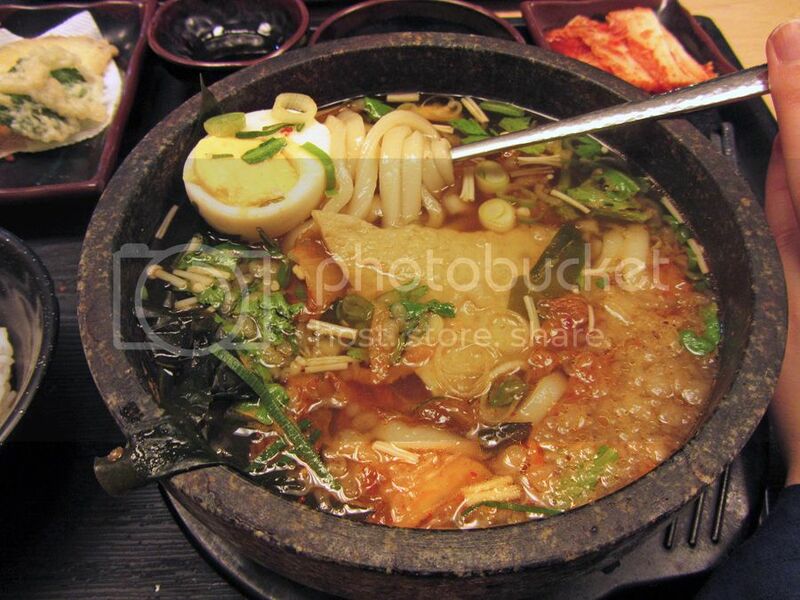 I never ventured into the city center (it was a far subway ride from where we were staying), so I'm sure Seoul has a lot more to offer and you certainly shouldn't take my limited experience as representative of the food there! I'd love to go back one day and try more! I've spent the last couple of days catching up on sleep (I slept 12 glorious hours my first night back!) and will soon start catching up on recipes - I hope to have a new one to share later this week! Wow! I cannot believe how busy you ladies were in Korea! What long days! Looks like you had a bit of authentic food. I have yet to try korean food! Holy cow! What kind of conference was this? I can't believe it would take up so much time. haha. I love reading about your travels! When we went to Japan, the 7-11's were one of my favorite parts of the trip. I'd drag my husband into them constantly so I could ooh and ahh over the different candies and chips and drinks. :) I'm sorry you didn't get more time to explore the city, but I loved seeing everything you ate! Hey! As a native Korean who happened to stumble onto your blog today, I think I can help you figure out your mystery side dish. Was is kinda salty and sweet-tasting? 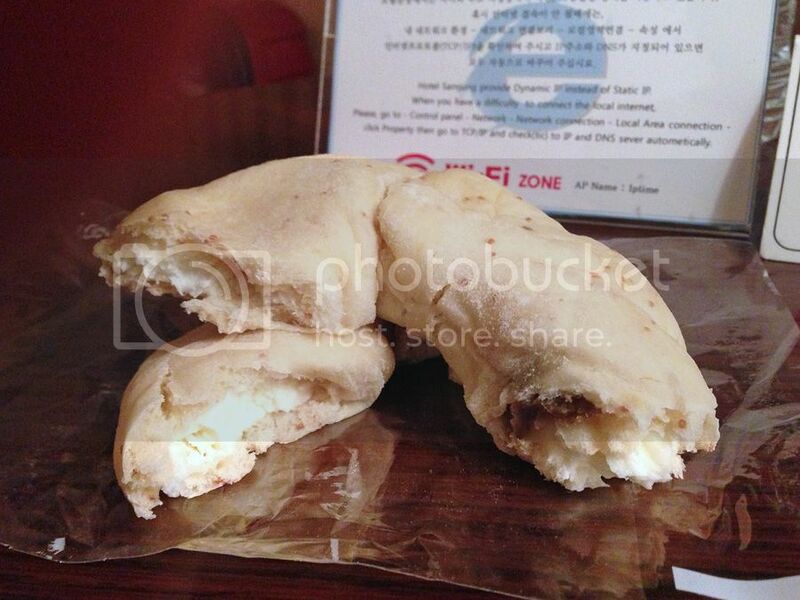 Going from your photo - my guess is 콩자반 (kong ja-ban), also known as 콩조림 (kong jo-rim). They're black beans - generally soaked and boiled down with things like soy sauce and corn syrup, and then usually garnished with sesame seeds. Thanks, Janne, that sounds exactly like what they were! They sound pretty easy to make too, I might have to try them myself sometime! I'm living in Korea now (been here 3 years) but in Daegu. I think the fried leaf was a perilla or sesame leaf! At first I HATED them but now I love them! They have a very unique flavor! Interesting - I didn't try that much of it but I couldn't tell what it was - now I wish I'd paid closer attention! Thanks for the info!